Educators and parents frequently ask the LCIRT team about their experiences, their research, and the evidence-based practices they recommend. Below you will find some frequently asked questions, with answers from our team, along with infographics you can download and use, and links to other LD, ADHD, and ASD organizations. How do I help my student with writing tasks? Question: I have bright, articulate students who can tell me everything about a topic but can’t get their thoughts from their heads to the paper. What can I do to help these students improve their academic writing? Response: You describe a difficulty faced by many students with dyslexia, attention deficit disorder, and executive function challenges. Academic writing is one of the most challenging tasks because it is so complex cognitively. It puts great demands on attention, memory (especially active working memory), language processing, and self-regulation. One of the best ways to manage this demand is to break writing a paper into a series of smaller, less cognitively demanding tasks, starting with accessing ideas and turning them into text. For instance, students can jot down their initial thoughts without worrying about sentence formation or essay structure, just to get their ideas rolling onto the page. Some students prefer to talk about their ideas out loud, either recording them with a personal recorder, or using voice recognition software, such as Dragon, to transcribe their thoughts. Other students get more traction if they start with a sketch or drawing and then describe that with words. I even have some students start by building a model with manipulatives like Legos or Tinkertoys to represent how their ideas relate to each other. A kinesthetic approach might be to have students “walk” their ideas, moving ahead when adding new content, moving to the side when elaborating those ideas, and moving back when presenting opposing arguments. Another student can be a scribe as the student walks, or the student can use a voice recorder to capture their thinking. All of these approaches free the student from the tyranny of the blank page and give them an active way to begin transferring knowledge from their head onto the page. Question: What exactly is executive function anyway? 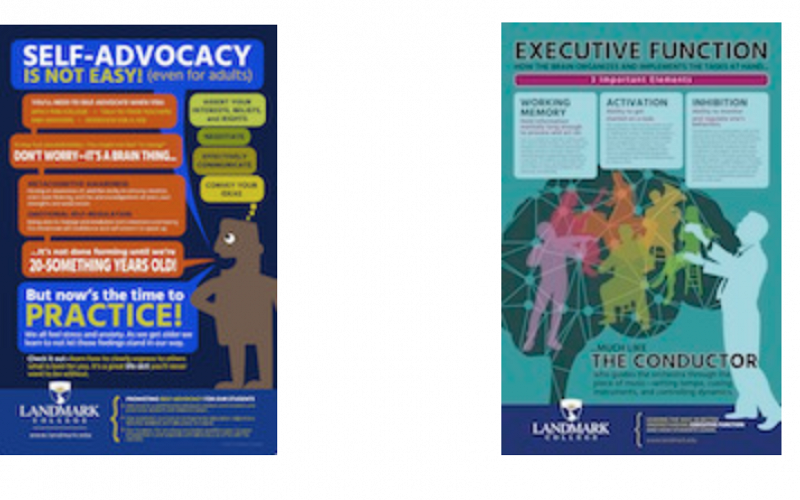 Response: Learn more about executive function by reading our one-page overview, and then learn about the ways that executive function supports are integrated into every aspect of student life and learning at Landmark College. For educators looking for in-depth training on Executive Function (EF), learn more about our professional certificate series focused on EF. Question: How does Landmark College assist its students in organizing schedules and following through on tasks? During First Year classes, which are taken by all incoming students, we show students how to manage schedules by teaching a calendar system for monitoring schedules, appointments and assignments. We offer students the option of paper-based or electronic calendars. Many students prefer electronic calendars, such as Google calendar, for the ease of entering recurring events, the ability to color code different kinds of tasks, and especially, the feature of having text message or e-mail reminders sent to their smart phones at the point of performance. For students with chronic difficulty completing tasks on time, we offer specialized advising cohorts, which focus on advanced time/task management strategies. We also offer coaching services with professional coaches, who provide a consistent level of motivation and accountability for students who are developing self-management skills. Question: I am interested in learning more about developing and implementing effective classroom strategies to support students who have weak executive functions. More specifically, I would like to focus on two specific executive skills: task initiation and working memory. What interventions are recommended when a student has good problem-solving ability for a non-verbal task that is brief and highly structured, but cannot handle a complex task? How do I help a student who struggles with the ability to hold information in memory while performing complex tasks? Can you provide articles, books and research concerning this issue? Response: You pose interesting questions about how to manage executive function difficulties in the classroom. We highly recommend two books by Lynn Meltzer: Executive Function: Theory to Practice and Promoting Executive Function in the Classroom, which can expand on some brief suggestions based on our own classroom experiences at Landmark College. For a student who can’t handle a complex task despite good general problem-solving ability, we help the student develop the ability to micro-unit a task—that is, to break it down into a series of smaller, manageable steps. The University of Minnesota Libraries has an interactive assignment calculator on their website that helps students do this for long-range assignments. We suggest students enter the steps onto a template that gives check-off boxes for each step, so they can indicate when each step is completed. The template includes a due date or deadline for each step, with a Plan B box for a back-up date if the first deadline isn’t met. How can I help my student develop social communication skills? Question: Can you recommend some strategies to help me teach appropriate social communication skills to my students with ASD? Response: Students with Autism Spectrum Disorder (ASD) learn best when they are given explicit instructions and a manageable social context to practice appropriate language and actions. I recommend that students are first provided with clear and concrete social rules (e.g., stay one arm’s length from other person; follow the speaker’s conversation lead/interest). Teaching simple social “scripts” is a great way to model these rules. Social scripts can be written in response to the student’s personal needs, for a confusing situation or for an upcoming event. Once a script has been created, try to role-play how to initiate a conversation and how to predict and react to what another person will say. These sessions can also be recorded and used to review the socially appropriate and inappropriate behaviors displayed by the students to show them their areas of strength and the areas in which they need improvement. Learning is a complex and individual process. There is no single best way to learn, but most students follow a well-defined trajectory of learning milestones as they move from preschool through high school. Students who learn differently, on the other hand, often do not perform well within the confines of traditional formal education. To help you better understand students with LD, ADHD, and ASD, we have provided resources and links on this page. Please be advised that our responses do not represent legal or medical advice. Landmark College is not liable for any consequences, adverse or otherwise, due to information provided on this site. If you’re seeking more in-depth information on these and other issues related to students who learn differently, LCIRT provides a variety of professional development options for both individuals and schools, colleges, and organizations. To receive free materials, including updates regarding research and best practices, subscribe to our newsletter. on Self-Advocacy and Executive Function. Learn more about the benefits of a neurodiverse society from Landmark College’s Center for Neurodiversity.